This was an okay experiment, I suppose. 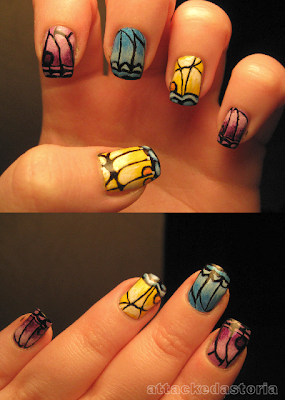 I wanted something nice for the summery weather we'd been having, so I figured hey, butterflies. I like how the purple and blue one turned out, but that's it. Next time around I'll try a different angle, I think. I ended up taking this off two days later because I was having problems with my middle nail peeling and cracking. My middle nails hate me, I swear.. Some frankening/mixing to get lighter shades.